ecent People, Decent Company is a must read for anyone interested in building character and encouraging others through integrity and respect." Dr. Robert (Bob) Turknett is co-founder and CEO of TLG. He is a licensed psychologist with over 28 years of consulting experience. Bob specializes in CEO Consulting, executive team development and individual development and coaching. He has served as an executive coach to more than 1,000 executives in more than 100 companies, both large and small businesses in a variety of industries. His unique approach to coaching blends psychological expertise with extensive business knowledge. Typical engagements involve work with a leader and the entire team, producing leadership development results that impact the whole organization. 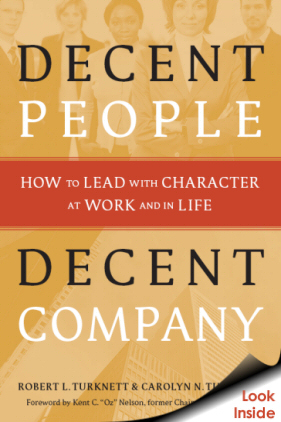 Bob, along with business and life partner Lyn, published a book about their work together entitled, Decent People, Decent Company: How to Lead with Character at Work and in Life. The book is based on the Turknett Leadership Character Model™ that describes the kind of character all of us need to lead wherever we are. TLG sponsors a Leadership Character Awards program each year in partnership with the Siegel Institute for Leadership, Ethics and Character, honoring leaders of character in the business, education and nonprofit sectors. Prior to founding TLG, Bob was in private practice for nine years for both the Georgia and Kentucky mental health and hospital systems. He was also a co-founder of the Georgia Psychological Health Network and Chief Psychologist for the Georgia Regional Hospital System. He received his undergraduate degree in business from Jacksonville University and his doctorate in psychology from the University of Georgia. He was a member of the Phi Kappa Phi honorary society. 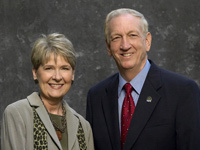 In 2006, Bob received the Leadership Entrepreneurial Award presented by Jacksonville University to an outstanding alumnus. He is a member of the American Psychological Association, the Georgia Psychological Association, the American Management Association, the Society for Human Resource Management, the Atlanta Rotary, and the Metro Atlanta Chamber of Commerce. In addition, Bob is an active United Way volunteer and served two terms as co-chair, with wife Lyn, of the Cole Society for Leadership Giving. Each year the Turknetts devote a portion of their time to pro-bono work with various organizations.